. While speculating whether it was an inadequate removal of LAA clot or new clot formation, the operating surgeon inspected outer surface of the LAA wall and found a part of the LAA inverted. The inverted left atrial wall tissue spontaneously everted with the improved cardiac filling and the image disappeared on TEE imaging. 1. Aronson S, Ruo W, Sand M. Inverted left atrial appendage appearing as a left atrial mass with transesophageal echocardiography during cardiac surgery. Anesthesiology 1992;76:1054-5. 2. Toma DM, Stewart RB, Miyake-Hull CY, Otto CM. 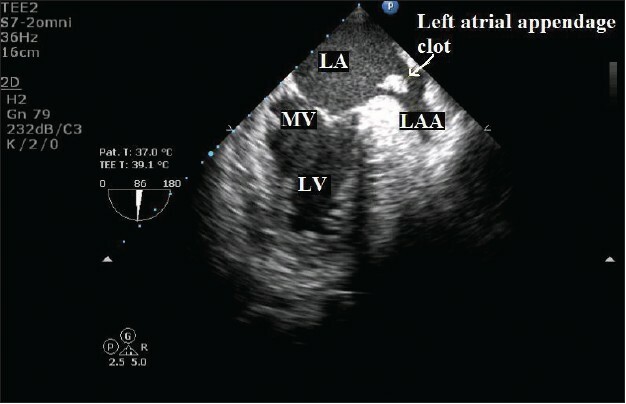 Inverted left atrial appendage mimicking a left atrial mass during mitral valve repair. J Am Soc Echocardiogr 1995;8:557-9. 3. Danford DA, Cheatham JP, Van Gundy JC, Mohiuddin SM, Fleming WH. Inversion of the left atrial appendage: Clinical and echocardiographic correlates. Am Heart J 1994;127:719-21. 4. Slavik Z, Salmon AP, Lamb RK. 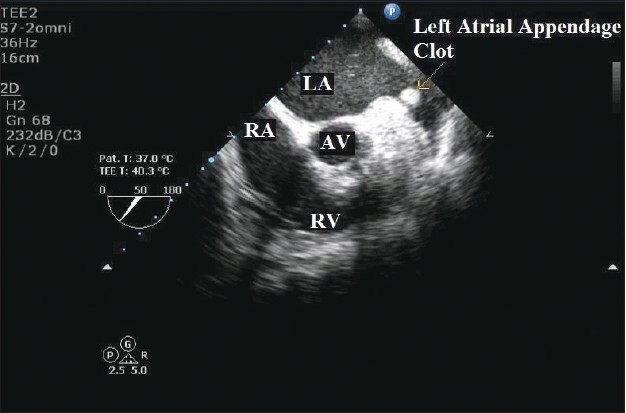 Unusual left atrial mass following cardiac surgery in an infant. Eur J Cardiothorac Surg 1994;8:566-7. 5. Minich LL, Hawkins JA, Tani LY, Judd VE, McGough EC. Inverted left atrial appendage presenting as an unusual left atrial mass. J Am Soc Echocardiogr 1995;8:328-30. 6. Cohen AJ, Tamir A, Yanai O, Houri S, Schachner A. Inverted left atrial appendage presenting as a left atrial mass after cardiac surgery. Ann Thorac Surg 1999;67:1489-91. 7. Smiles GS, Basu R, Mitchell IM. Inversion of the left atrial appendage: A complication of cardiac surgery. Heart Lung Circ 2012;21:117-9.